It’s finished! It only took a year and a half but it’s done. :) My Mom started this quilt and we worked on it slowly when I’d visit…now that its done I’m not sure why we didn’t finish it sooner! All those different prints look like a big fat mess together until you pair them with the solid color chevrons. The solids pull everything together so nicely. There used to be a free pattern online for this quilt that we used, but I can’t seem to find it now and the link is broken! If I find it I will update the link! The backing and binding are from her stash. We made this a tad smaller than the inspiration pattern so it’s a generous throw size. I like making quilts with my Mom because she does all the work. Now that we live just down the road hopefully there will be many more! What a wonderful quilt — I like the doing it together thing. I imagine it will bring back lots of memories later on. I love your work. Really beautiful! I love the pattern and your fabrics! Great quilt! On my list of things to do: make at least one quilt from each Cluck Cluck Sew pattern! Yep, I like them THAT much! What a cheerful quilt! I'd love to have that living at my house. Lucky you to be sewing with your mom. I love your fabric choices! It looks fantastic! I think it's great to do a project with your mum (or mom) too! Welcome! My goal is to make a bunch of your quilts for the show in February (Kitsap Quilters). Love the quilt. I also know how wonderful it is to spend time sewing together. I love sewing with both of my daughters. So awesome. I have already got fabrics picked for this! Yours is gorgeous! Must be fun being close to your mom and being able to sew together!! I LOVE this! I've used this pattern before (in the conventional one direction/white background way) and I really love that too, but now I must try this! This is beautiful! I love scrap quilts. I loved the Boy 1 quilt, but I think I love this one just as much. This would be perfect for all the scraps I have! What a beautiful quilt:) love it! 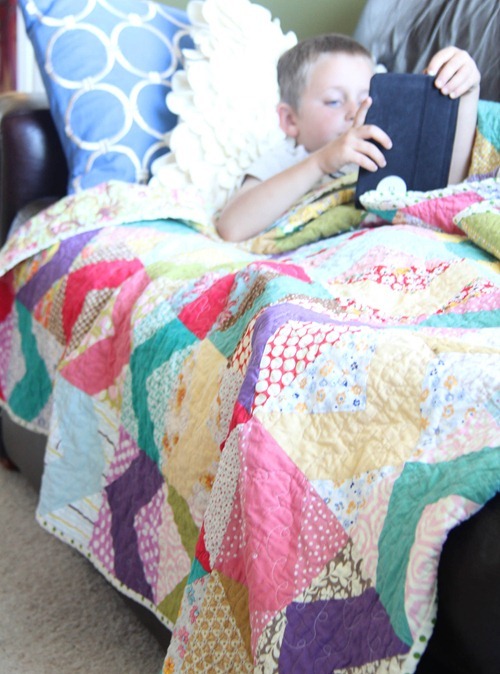 What an awesome quilt…and I love the part where your Mom pitched in to help! I like this quilt even better than the previous one with more controlled colors! This is really a pretty one! 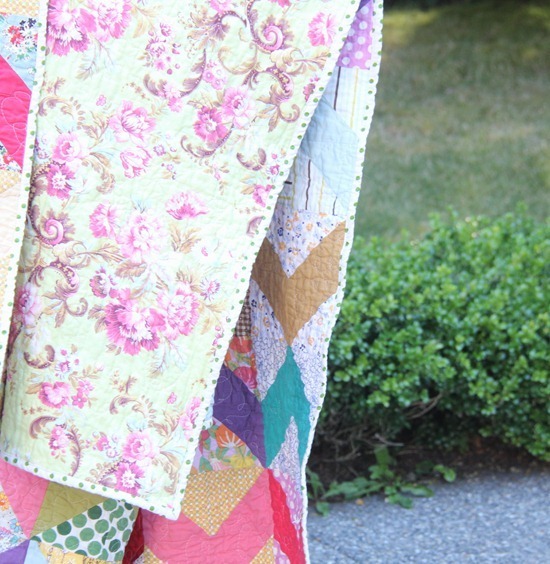 Really like all the color and the overall scrappiness of this quilt. 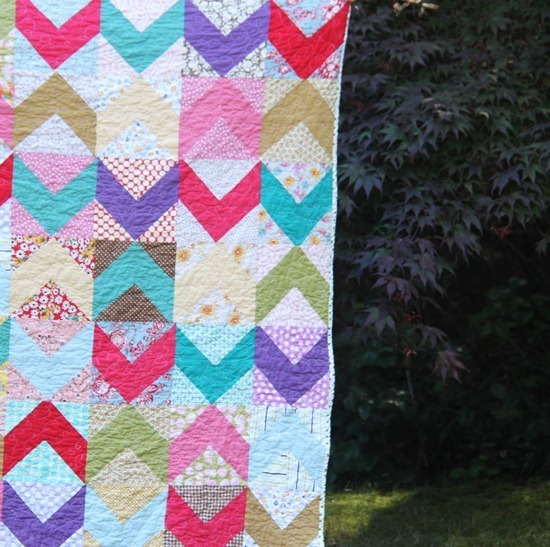 I'm kind of obsessed with chevron – and this is such a fun variation! 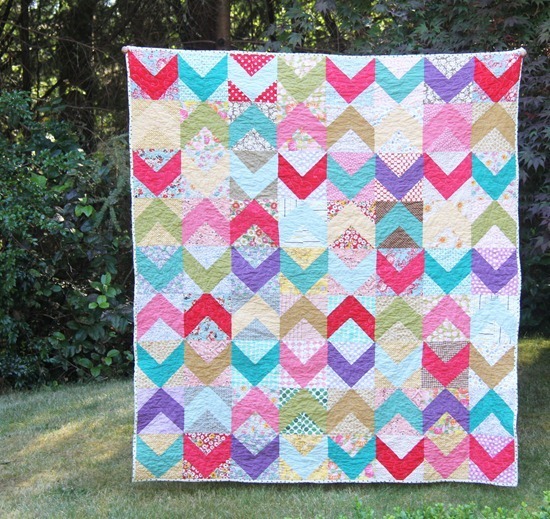 It looks amazing and I'm not one who is big on chevron… but the quilt you made with your mom is beautiful. Thanks for sharing!! That is just the warmest, snuffliest, sweet, beautiful quilt. I love it. I want one! So cheery! Fantastic and a perfect pattern for all my vintage fabric I've been collecting! Thank you!!!! Love it , printed, start cutting today , As I'm looking at it ,4 matching blocks? Love this and how nice to be so close to your Mom again! Must make you both very happy! I really love it! It looks like a great cuddle quilt. Love the scrappy look. Hope you are all moved in and settled. Gorgeous! Love it. Someday I shall make a quilt. Someday soon. Really cute!!! What size is the blocks? I love that quilt. Colors look so nice together. Cozy! What a gorgeous quilt! It is beautiful, and I love that it was a chance for you to do something together too! It's beautiful… Your quilting is always so beautiful. Me encatan todos tus trabajos!!! I LOVE the colors!!! Thanks for showing this. I was looking for inspiration for my next quilt. I will totally study your color combos. I love this quilt but how special it must be that you did it together. I just made some coasters using your instructions for the chevron block. This makes me want to jump in head first to a quilt. AHHHH Completely gorgeous! I'm so envious that you can do this amazing work! awesome job! So wonderful but I'm betting the time you get to spend together is the best part. That quilt is so fabulous! I can see it is already getting the love it deserves. And how cool is that that you and your Mom got to make it together:) Great job!!! It is gorgeous! I like the combination with solids and prints.